For a lot of working film and television professionals, the first foray into the industry was in the entry-level position of ‘Runner’. Whilst it may not be the most glamorous of positions, the role offers an opportunity to gain an idea of the inner workings of a production, make contacts and ultimately get a foot on the ladder. It’s all too easy to dismiss the position of Runner as menial or degrading, yet it is the runners of today that will inevitably be making the television programmes and feature films of tomorrow. So, What do Runners do? In this entry-level position the role and the responsibilities that come along with it are usually pretty varied. But, it’s by doing all these different tasks that you’ll get the skills needed to progress your career in the film and TV industry. As a Runner you’ll be responsible for the maintenance of the set, keeping it clean and tidy. You’ll help motivate the rest of the production crew, distributing coffee and other caffeinated drinks to help the crew make it through the usually long and unsociable hours. You’ll facilitate meetings by arranging meeting rooms and organising the catering. You’ll help in the preparation of the set for filming, organising equipment and undertaking other administration duties. What Areas Can You Work in as a Runner? There are many tasks that a Runner may be expected to do. These can include being responsible for general administrative duties such as delivering post and messages between departments, running errands for other members of the production, looking after visitors and being responsible for delivering scripts. This involves working for production companies with a view to working outside of just production. This type of position can be highly sought after and competition is often fierce for places, but the benefit is a route into potential full-time employment with a production company or in post-production. Working as a production runner is a great opportunity to develop a potential career as a PM. Production runners are a valuable link in the chain of communication during a production and will often find themselves working to ensure that all crew are well informed, as well as working alongside researchers and other office personnel. Working as a floor runner is an ideal way to pursue a career as a third, second or first AD. Assisting on set to ensure that everything and everyone are ready and prepared is a great way to network and build a reputation in a reasonably short space of time. Working as a rushes runner may mean that you aren’t necessarily on set or in post-production but helping as the link between the two – it can be a great way to get one foot on the ladder whilst gaining an insight into the way a production is brought together. Short films can provide the perfect opportunity to gain insight into every stage of production due to their budgets. Although these productions will adopt smaller crews, it is an ideal opportunity to experience every stage of production from pre-production through to post. As the majority of short films operate on a restricted budget, it’s unlikely to expect a large pay packet, but the experience could become invaluable in your future career. According to BECTU, the UK’s media and entertainment trade union, Runners can expect to earn anywhere from £7.93 per hour for short films (student films and not-for-profit collaborations) to £14.15 per hour for branded content – when excluding holiday pay. It’s worth noting that whilst some productions do take on Runners on an unpaid basis, this is not something we at ProductionBase would encourage, and all Runner jobs posted on our jobs board will pay at least the national living wage in all cases. 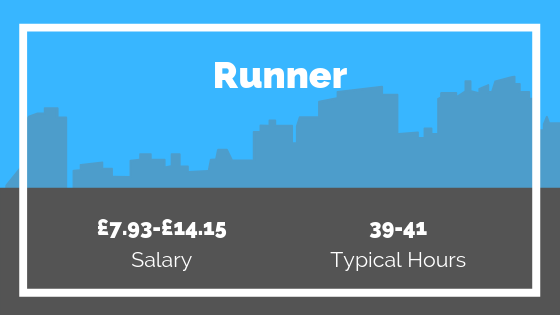 In what is a very competitive industry most Runners tend to work on a freelance basis. While this can offer the bonus of flexibility and time for relaxation between productions, it does mean you will have to be constantly searching for that next job. Runners typically work long hours. Often shifts will overrun, working times will be irregular and most likely unsociable. In this role, you will have to be both an early bird and a night owl as shoots will often start early to make the most of the daytime, and will more often than not run into the evening. However, the bonus of being a Runner is that you will be able to travel to a lot of new locations, and may even be able to go abroad for the production. As you gain more experience working as a runner you can expect a slight increase in salary, however, the most noticeable salary increase will come alongside a promotion to the likes of Head Runner or even to a more senior role. Working as Runner is a great opportunity to gain valuable knowledge of different working environments within a production. As a Runner, it’s more than likely that you’ll be working on projects for short periods at a time. It’s not the production that you work on that is key, but the people you are able to network with whilst there. Building a network with other runners and entry-level professionals is something that you are able to do reasonably quickly as a Runner and can become hugely beneficial if and when those people find themselves higher up the ladder in the future. Finding runner work can be quite laborious but once you’ve armed yourself with a nicely polished CV, emailing and delivering it to production companies is only half the battle. Here are some tips to help find a Runner position. Individually tailor your CV to each position. It may seem that once you’re happy with your CV then mass distribution seems the only way. Tailoring your CV and cover letter to each position could be the difference between you and another candidate. Production companies receive vast numbers of unsolicited CVs which largely fall by the wayside. Finding out the name of the appropriate person to address seems a no-brainer, yet it’s perhaps the simplest way to enable you to get your foot in the door. Check industry directories such as PACT for the contact information and background of companies so that you know who you’re addressing. Work experience placements are also a viable route to securing runner work and possible permanent employment. Work placement schemes can be found in more detail at the websites of companies such as Channel 4, ITV, and Vertigo Films. You could look to join The Production Guild, an organisation that brings together those looking for work in production. Further, they offer a Runner Training course, a course led by leading industry professionals which will kick-start your career and give you a chance to experience what working in the industry will be like. All Production Guild members are also eligible for 25% off ProductionBase membership. In what is a highly competitive industry, experience tends to be favoured over qualifications, especially when it comes to the highly practical role of the Runner. However, that does not mean that a degree is not useful when looking to start out in the film and TV industry. Not only does it demonstrate your passion, but it also gives you a good starting point and a solid foundation in terms of your knowledge. If you haven’t worked it out yet, working as a Runner is all about learning as much about the Production process as possible, putting in a lot of hard graft and seizing every opportunity you can. While this type of learning may not be for everyone, the valuable skills you gain along the way will stand you in good stead for the rest of your career. So, what can I do after becoming a Runner you ask? Well, if you stick at it and develop your skills you can look to progress to becoming a Production Assistant, Researcher or a Head Runner. Don’t be disheartened if it takes longer than you thought to move through the ranks, there is a lot to learn and usually you’ll need to wait at least one year, if not two before taking the next step in your career. If you are ready to take the first step towards your career in film and TV, why not check out our jobs board. ProductionBase has its very own Runner Jobs Board which you can view here. We also offer a dedicated graduate membership for new entrants to the industry, which includes one-to-one CV advice sessions, access to exclusive networking events, and your own spot in our member directory – searching by hundreds of production companies every week. More details here!